DisplaySoft™ Florida Probate Forms Software features Modules that make Probate forms generation easy! 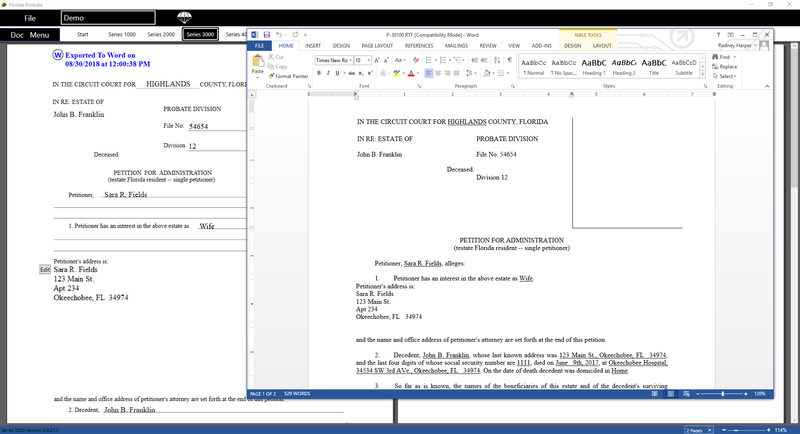 Quickly produce official FLSSI replicated Probate Forms or print to Microsoft Word™ or use our own built in DisplayWord™. Why make it more difficult? 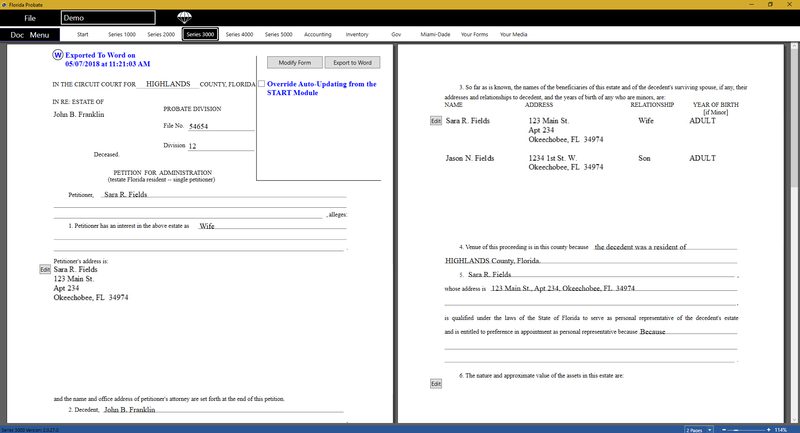 DisplaySoft™ Florida Probate Forms Software is Quick and Simple! 15 Minute Live Webinar and/or order a FREE 90 day trial. Modules to Make Probate Forms Simple! Print, PDF & Email replicas of the pre-printed forms with the official logo or send them quickly to Microsoft Word™ all in one interface. Print, PDF & Email approved special smart forms required in Dade County. Print, PDF & Email replicas of the preprinted government SS-4, IRS-56, DR-312, DR-313 & F-706. 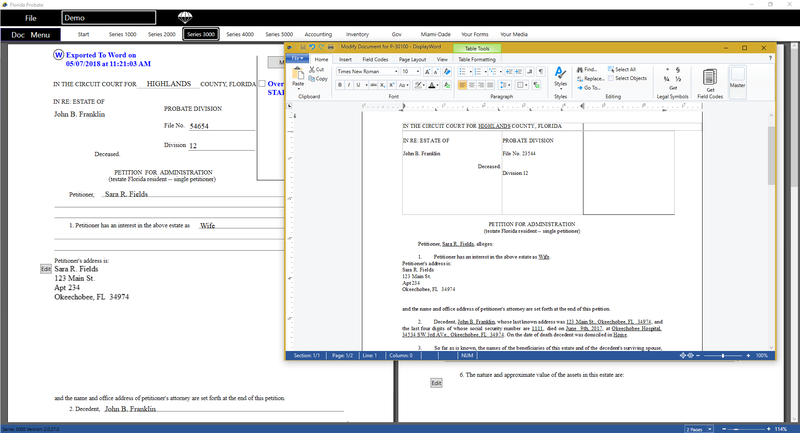 Create or Import your own Microsoft Word™ documents for an easy to use and understand “Your Forms” document merge system. Store PDFs, Scans, Pictures, Audio & Videos in “Your Media”. Includes accounting form P-5.0340. Capable of endless entries and auto math feature that makes your accounting procedure simple and fast. Includes categorized entries for items including: Real Estate, Vehicles, Insurance, Personal Property, etc. Also includes inventory forms P-3.0900, P-3.0901 & P-3.0920. Annual Support is paid up front and covers you for the first year. Single user pricing – Call for multi-user pricing. Pricing is broken down into different levels so that firms who do a lower volume of Probate or firms that are just starting out don’t have to pay the same as a firm who does a large volume of Probate. For example, the ELS-20 (Entry Level Solution 20) only stores 20 files simultaneously. When you create your 20th file, you cannot create another one until you delete one or upgrade to the next level.